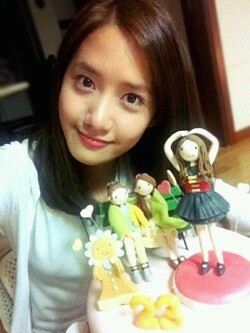 Girls’ Generation member YoonA published her birthday photo. On May 31st, 2012, YoonA said through official website, “Thank you for supporting ‘Love Rain‘ and wishing me Happy Birthday. Because of you I will work harder, because of you I have more chance for activities.” At the same time, she uploaded a photo. In the photo, YoonA was holding a birthday cake, staring at the camera. YoonA almost without makeup, her glowing skin is amazing. The number 23 on the cake represents the age of YoonA, what’s most striking is that the small doll the cake is resembling YoonA when small. Netizens commented, “YoonA, you’ve worked hard,” “So beautiful,” “YoonA said thanks to fans, too good manner,” and so on.